Sometimes the most basic lures really aren’t so basic. We often feel that when we buy a lure we can take it out of the package and go to a body of water and catch fish on it. You may be able to catch fish on spinnerbaits straight from the package, but there are many modifications that will allow the lure to work under any conditions. 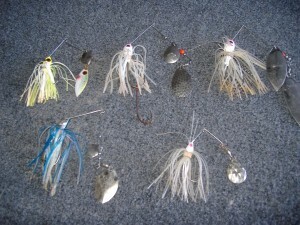 With so many options it is hard to narrow down which lures to take to the water. Today we are going to talk about how to narrow down the selection process and eliminate taking a heavy box of too many lures. In the following we will talk about different techniques, skirt colors and sizes, blade shape, color, and size, and some lure tuning tips. It is hard to find a place to start when deciding to talk about spinnerbaits. Let’s start with one of the two most important parts to the spinnerbait. The most interchangeable part to a spinnerbait is its blades. There are many shapes, sizes, colors and textures in which we can choose from. 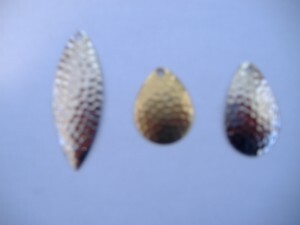 Some of the common blades styles that we can find regularly are the Willow Leaf, Indiana, and Colorado blades. These different blades should all be utilized for what they types of fishing conditions they best fit. The willow leaf blade is great for clear what fast retrieves. Because of the long slender shape of the blade it disperses very little what, but still puts off a great deal of flash which allows you to cover water faster. The Colorado blade is a round blade that is good when the water is stained or muddy. Because the Colorado blade is round it displaces more water and causes a greater vibration. Due to the low visibility of the water vibration because very important because the fish are no longer seeing what they are attacking. The Indiana blade is basically a hybrid between the Colorado and willow leaf blades. Indiana blades are elongated round blades which disperse a good amount of what, but can still be used to cover a lot of water. This blade is great for waking near the surface for aggressive bass, pike, and muskie. All of these blades come in common sizes of size one through size six. The bigger the number means that the blade gets bigger. This doesn’t mean that there aren’t half sizes or larger sizes. These are simply the most common stock blades which come on prepackaged lures. 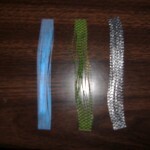 Spinnerbait blades come in many colors as well. The two most common colors are silver and gold. However, there are painted blades for special conditions. For example, I like to use white blades when I fish the river for smallmouth bass. I just think it gives me an edge on everyone else that is throwing a spinnerbait because not everyone is changing out blades. Next, we should talk about the second most important part of the spinnerbait, which is the skirt. Stock skirts on spinnerbait may be limited in color because company can only afford to mass produce so many colors. Remember that you can always buy pre-made skirts from many companies that you can replace the stock skirt with a new skirt. You can also build your own skirts by buying precut lengths of skirt material or bulk material. There are two main options when making skirts, which are rubber and silicon. I have no preference between the two because I feel that both have their advantage at certain times. Skirts shouldn’t be picked just because you have a hunch. You have to do a little research about the baitfish and natural forage of the body of water that you are fishing. For example, if the primary baitfish is gizzard shad then you should pick a white color and not a fire tiger color. Since you are matching the color of the baitfish, be sure to cut the skirting to match the size or your baitfish. If the shad are four or five inches long then a bigger skirts is necessary, but if they are two to three inch baitfish then it is necessary to cut the skirt down. By matching the skirt color and size to the baitfish you will up your catch rate. Now let us talk about the different techniques that you can use to make spinnerbaits work for you. Every angler starting out thinks that all you have to do is cast it out and reel it in. Even though you can fish a spinnerbait that way it will be a lot more successful if you make the lure do certain things. The first technique is called slow rolling. Slow rolling is basically casting out and reeling in at a very slow pace. This technique can be used in the shallow weeds during the pre spawn or it can be use on ledges, creek channels, and brush piles to gain strikes during the post spawn and summer months. Since slow rolling is done mostly in deep water, when fishing a Western Pennsylvanian lake you should be using a ½ to ¾ oz. lure to keep the lure in contact with the bottom or structure. Making contact is crucial to catching fish because that is what is going to trigger your strikes. Burning is another technique that can be very effective. This technique is when you are reeling the lure in so fast that it never drops one foot below the surface. The water conditions have to be right in order for this technique to work though. First the water has to be very clear so fish will come from a distance to strike. It also helps it the sun is shinny, but that isn’t a must. Burning is very effective when fishing for clear water smallmouth bass and hybrid striper. I have been told that muskie and pike can be taken on this technique as well. When you are burning your bait try doing a short pause letting the lure fall slightly and then start burning again. That will trigger a great deal of strikes when fish are following the lure. Yo-Yoing is the last technique that I am going to talk about. This technique can be used any time of year, in any water condition, and at just about any depth. When using this technique you want to make long casts and let the lure sink to the bottom before you start putting the lure in motion. Once the lure hits bottom reel the slack line and place your rod at the nine o’clock position. Then raise your rod to the twelve o’clock position and let the lure fall back to the bottom. Continue this retrieve until the lure is back at the boat. You will have to let the fish determine how fast you are able to work the lure. Sometimes you will be able to use a ¾ oz. spinnerbait and work it extremely fast and other times you might want a 3/8 oz. spinnerbait and slow way down. I personally prefer the slower approach when fishing in weed beds. When fishing a spinnerbait you will have to make some minor adjustments or tune your bait as you fish with it. The first thing you want to check is that the wire of the bait lines up with your hook and remains straight the length of the wire. If it isn’t simple bend it back into shape with you hands or needle nose pliers. Also, you can cut the wire length down to make the lure seem smaller and faster. This will help if you are getting short strikes because the blades are going to be closer to the hook. You can also squeeze the wire together placing a smaller gap between the hook and the blades doing the same thing. On the other hand you can spread them apart to make the lure slower and larger. Maybe the greatest improvement you can add to your spinnerbait is a trailer hook. This will just about eliminate short strikes and make them hook ups. You can add a soft plastic trailer to you lure to give more action and a bigger target for the fish to eat. Remember to play with you blade and skirt sizes as well to match the baitfish. When you are getting ready to head to the lake this year with your box of spinnerbaits remember a few simple things. Most importantly you need to match the size and color of the local baitfish. Also, you don’t need to take a bunch of spinnerbaits, but you need a couple in each size so that you can change blade sizes and skirts size and color as you fish. Try multiple techniques, pauses, jerks and speeds until you find the correct retrieve for the conditions and day. Good luck to all and remember to have fun.